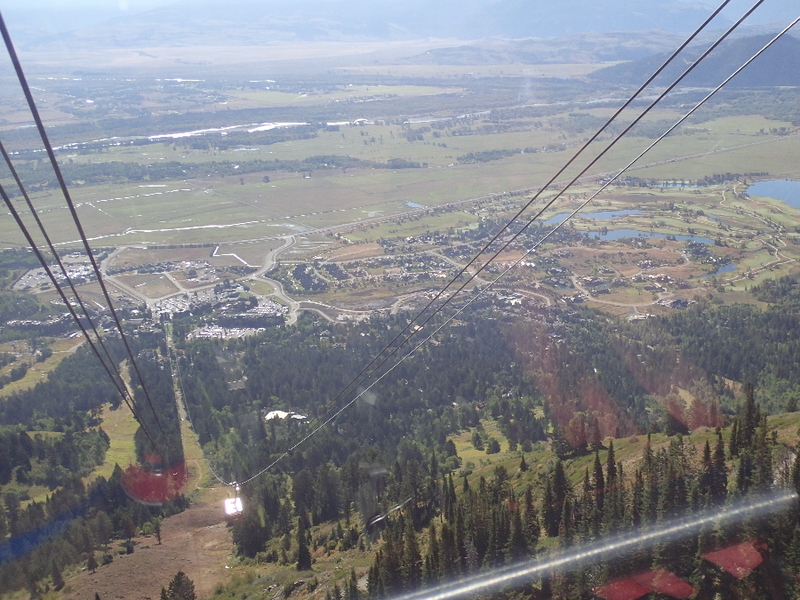 Main tram at Jackson Hole. 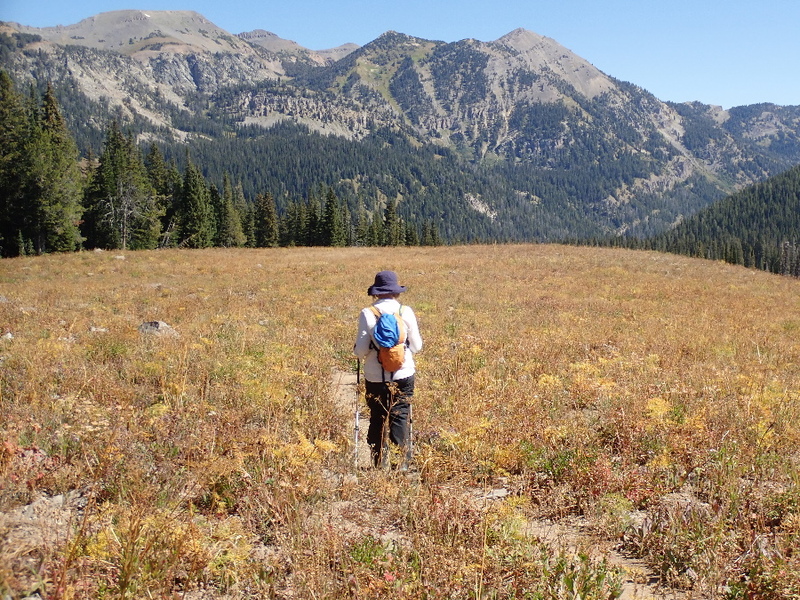 One more day of hiking in the Tetons – what shall we do? 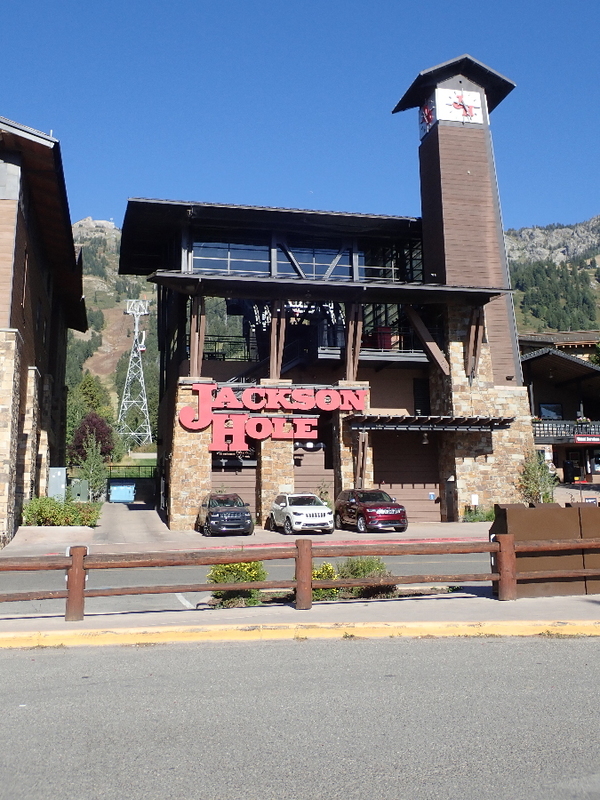 Something a bit different, let’s take the Jackson Hole tram up to the top of Rendezvous Peak and then hike down the backside via Granite Canyon. 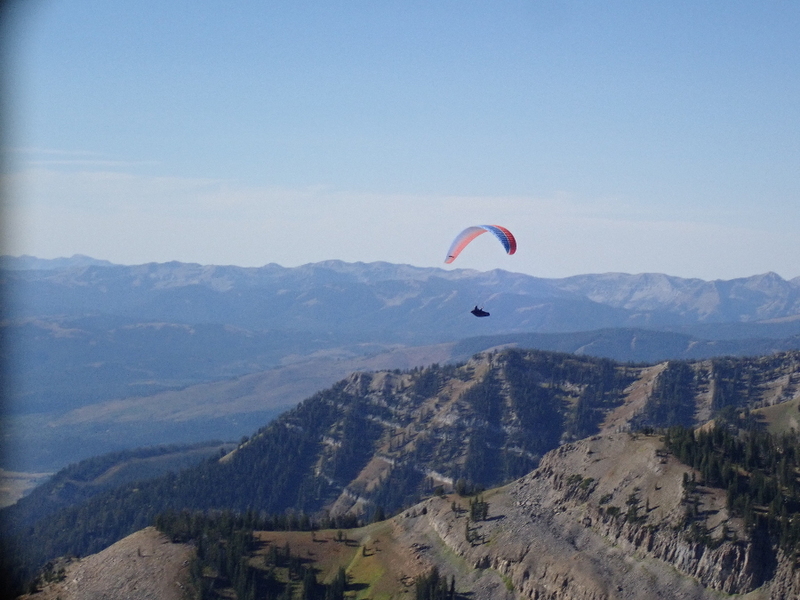 Paid $35 each for a ride up the mountain to an altitude of 10,450’ and watched the paragliders take off and ride the up thermals of the morning. 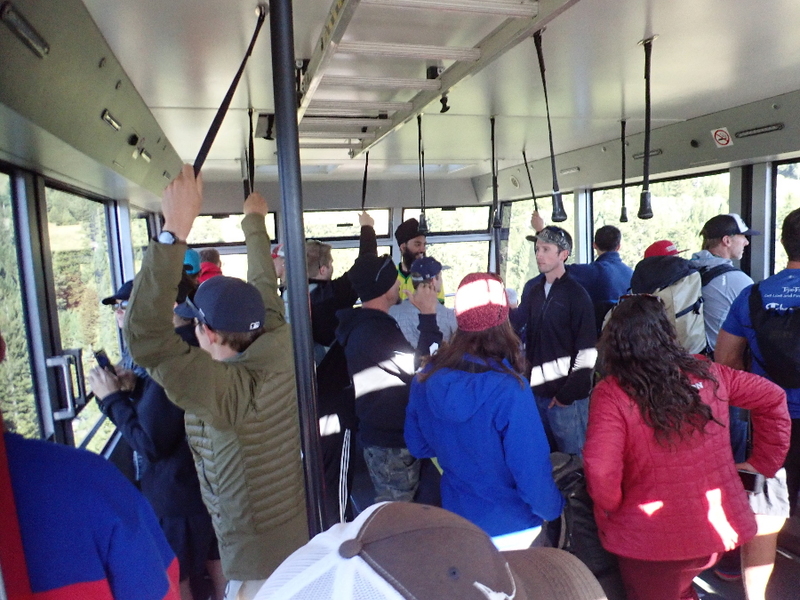 Inside the tram going up. 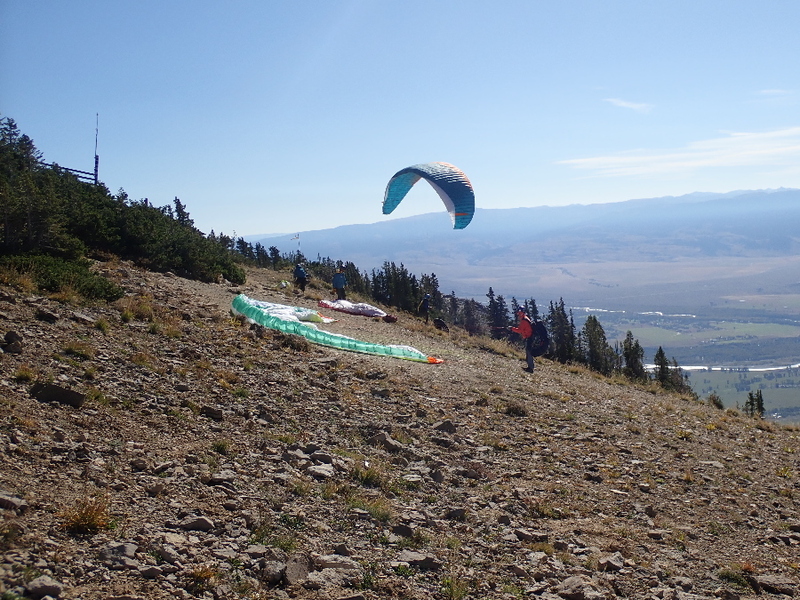 Back down onto Jackson hole. 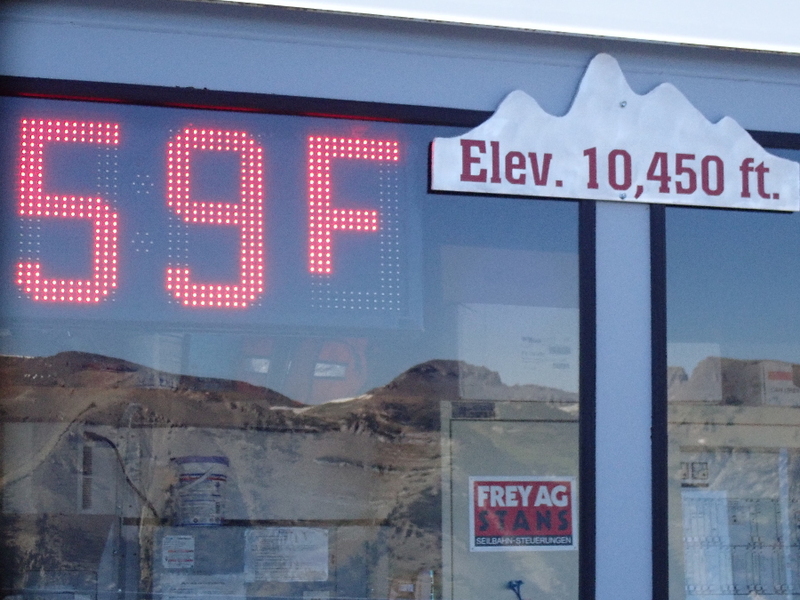 Nice temperature for a hike down. Heading off down the ridge. Always wondered how they took off. 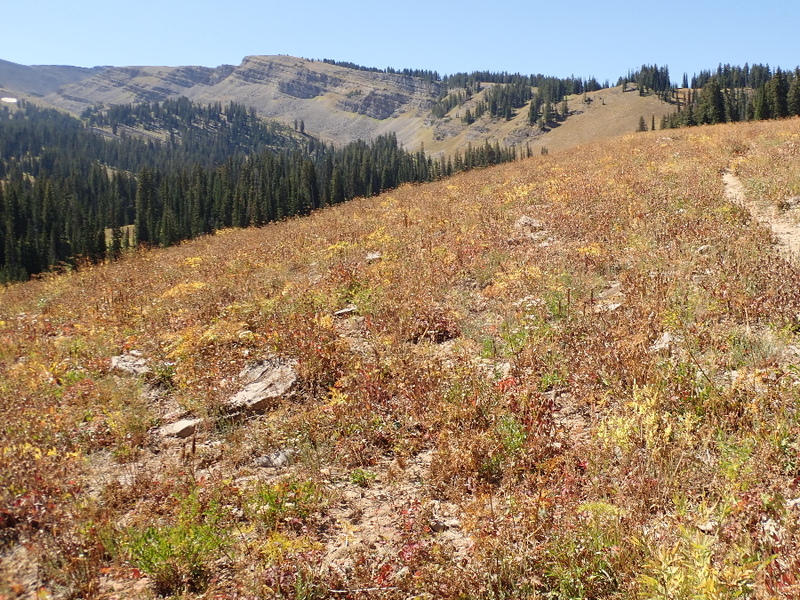 10,000’ is well into the alpine zone and we followed the scree ridge down to the park border and where the stunted pines start to grow. It’s a nice mellow hike in the cool of the morning as the trail swoops around to find a broad ridge that will drop us into the canyon itself. 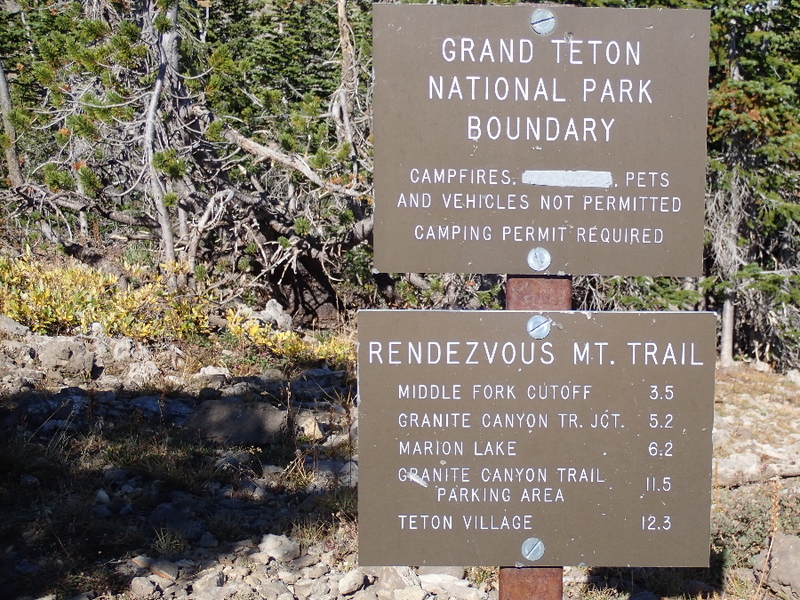 We’re taking the rendezvous trail down and then back to Teton Village. Dropping down into Granite Canyon. Looking back. We came off the peak in the upper left. 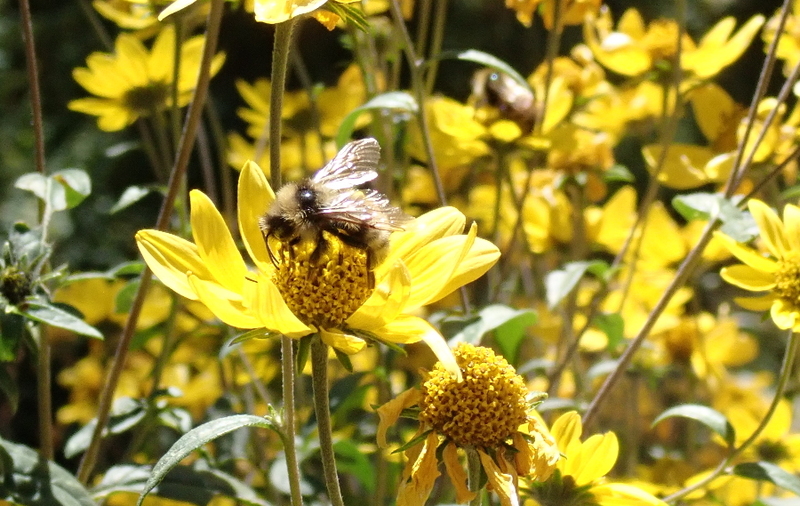 While lunching this bee was doing the same right in front of me. 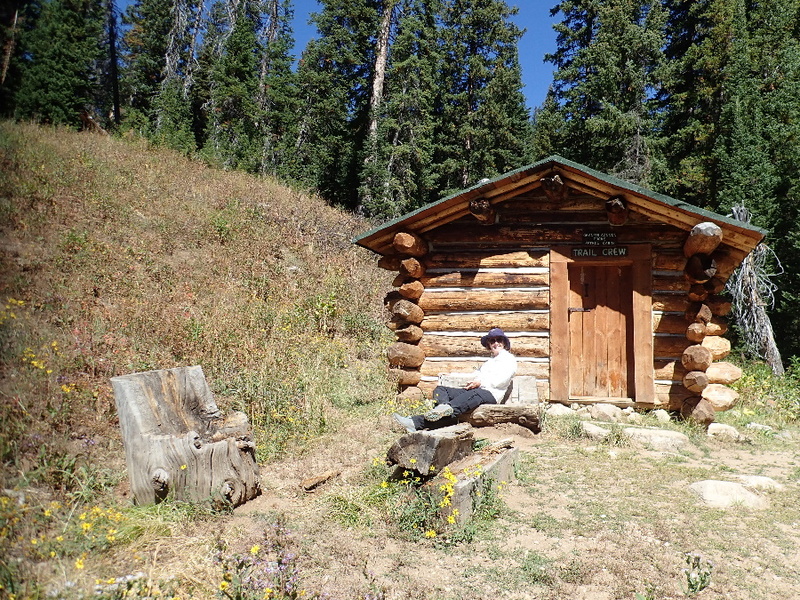 Cabin used in the 1920’s construction of trails. Lunch was at a cabin close to the trail junctions and we passed another couple doing the same hike as us. Once Granite Canyon exits you can go straight to the canyon trailhead or have to turn left and hike the 2 odd miles back to Teton Village where we had left the car. A bit of a bugger when you’re tired and just want to get those boots off your feet. 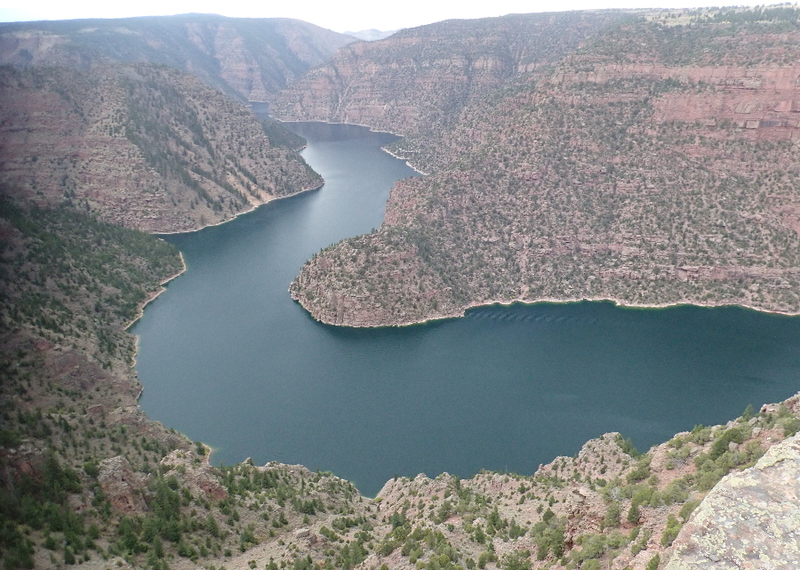 Left Jackson and headed south down Hwy 191 into new territory and Flaming Gorge. Stocked up with supplies in Rock Springs which was a good thing because, later, in Dutch John the construction “town” near the dam, when we asked for fresh vegetables the lady said “You can either go an hour north of an hour south for those”. 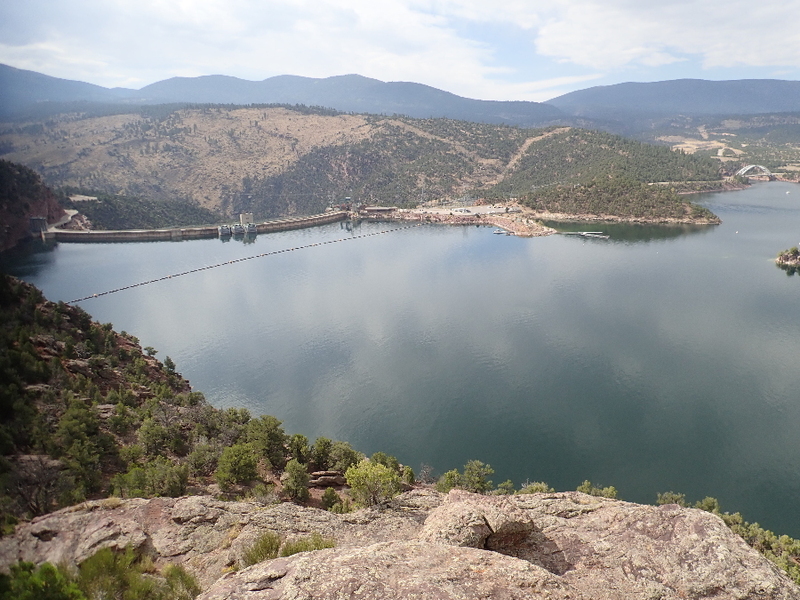 Top side of the dam – filled to the brim. 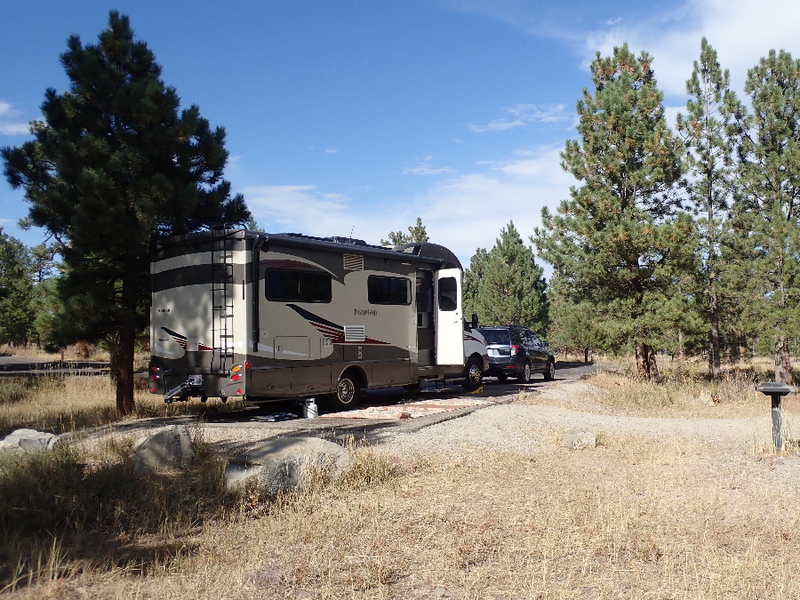 Our site in Canyon Rim campground. 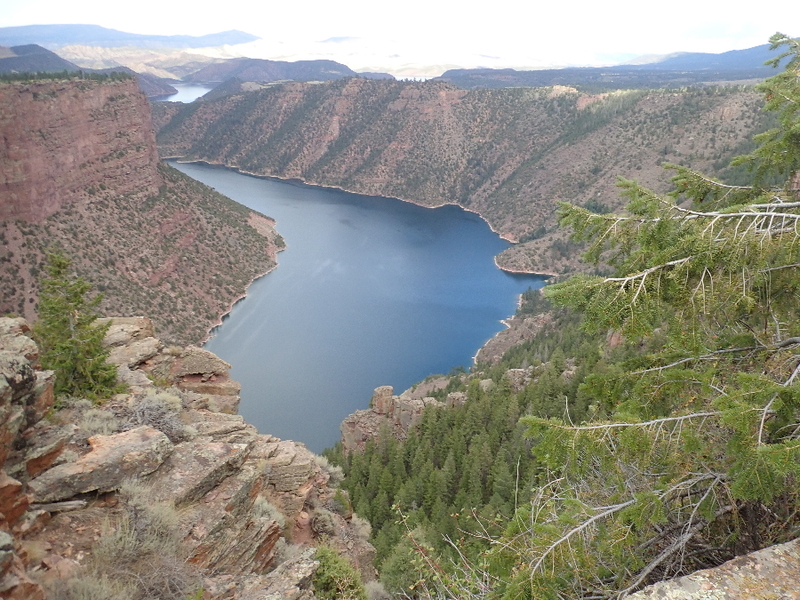 Went looking for Canyon Rim campground and found all the 18 sites taken and settled for Greens Lake nearby. Next morning I bumped into the ranger and he told me all the campgrounds were closing in a week and some even sooner. 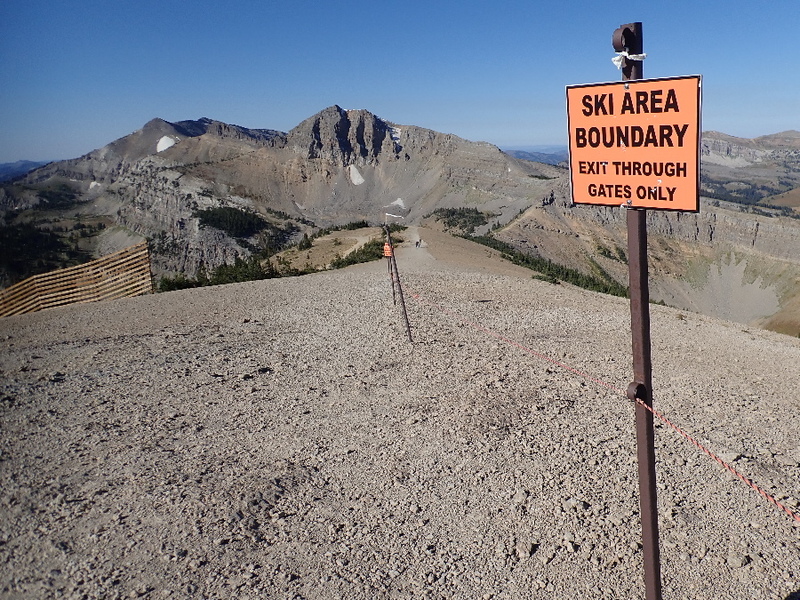 Went back to the Rim and found a now vacant site we could occupy for our next few days. Overlooking part of the dam. 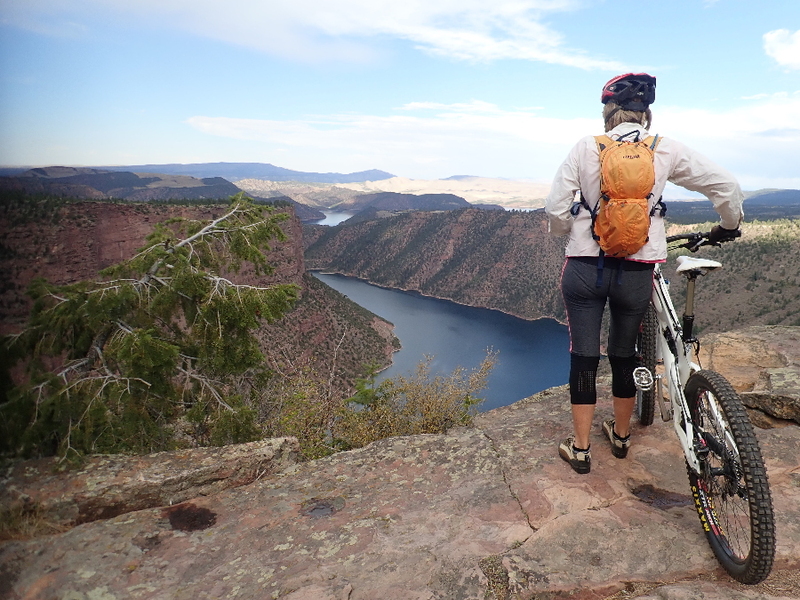 Broke out the bikes and rode along the rim for views of the dam. 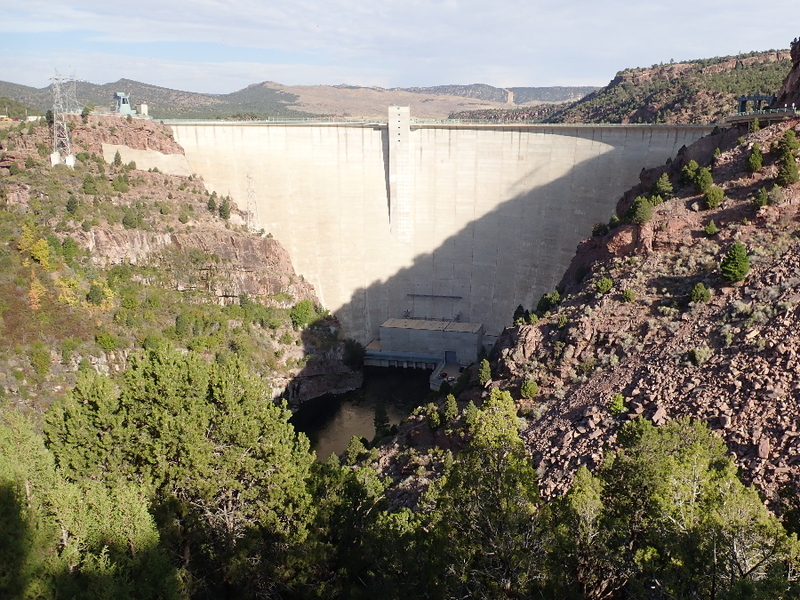 That one dam wall has certainly created miles of circuitous dam waters behind it, none of which can all be seen from one vantage point, but is certainly and engineering marvel in my mind. Another view from the rim. This dam winds it’s way for miles upstream. 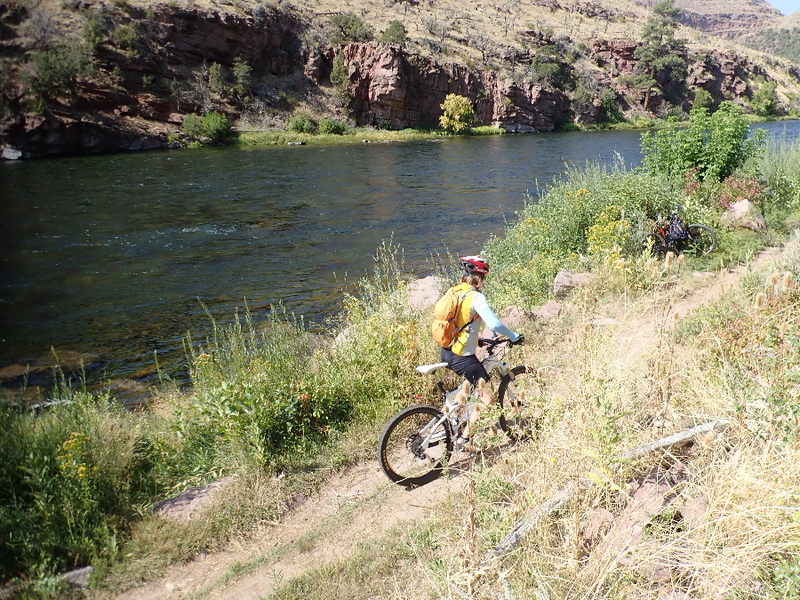 River trail below the dam wall. 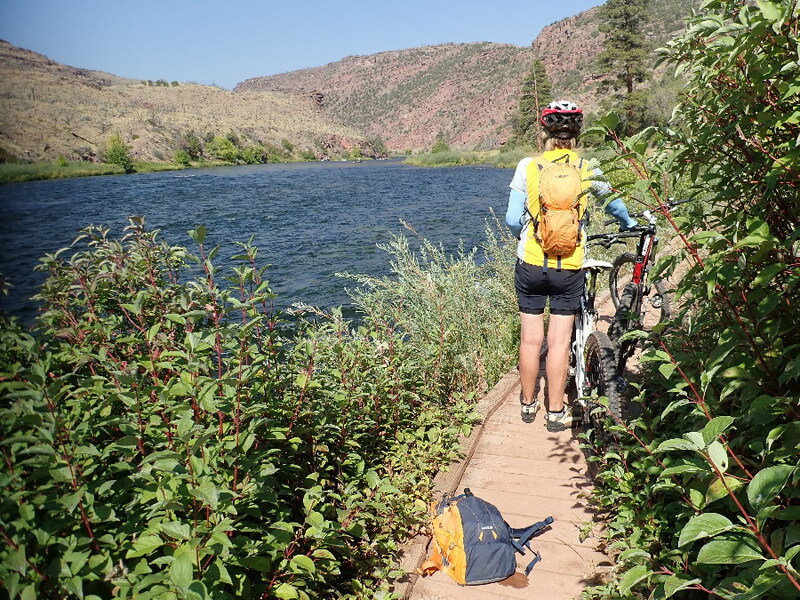 Looking for trails you can also ride on we head over to river trail below the dam itself. 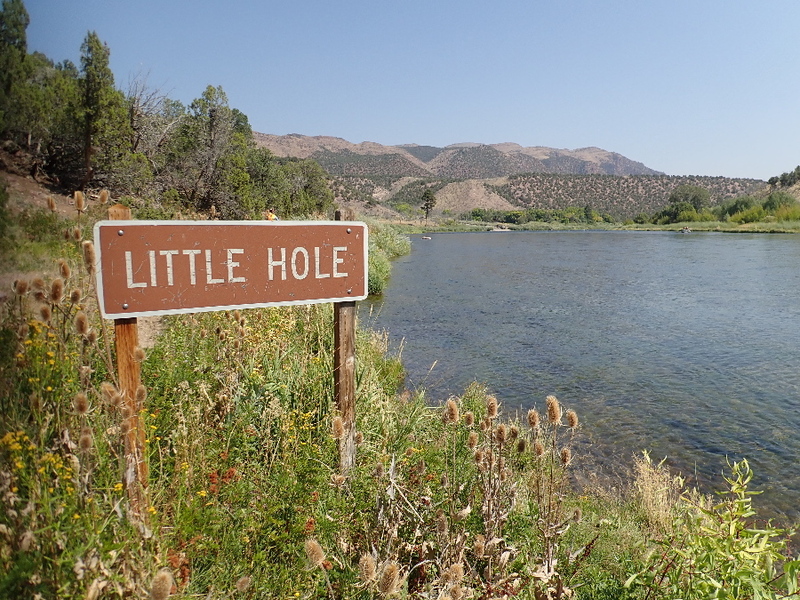 Popular spot for fishermen to launch just below the dam and drift fishing down to Little Hole where they take out. Requires some skill and the boats seem to have skippers whose sole duty is to negotiate the boat through the rapids and other submerged obstacles. 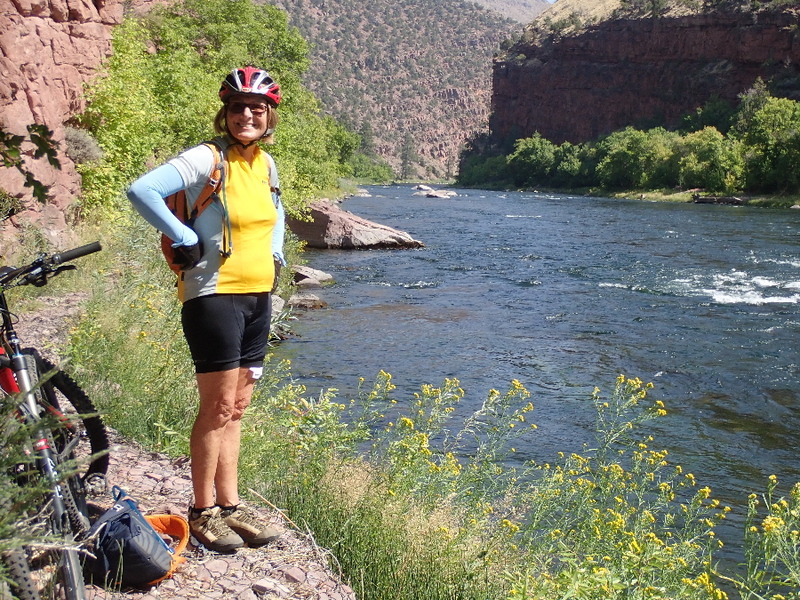 We started riding up the trail alongside the river but after 2 to 3 miles it became apparent the trail was best suited for hiking and not biking. Very nice trail and I would do it as a one-way shuttle if there ever is a next time. This is the Green River that has been dammed. 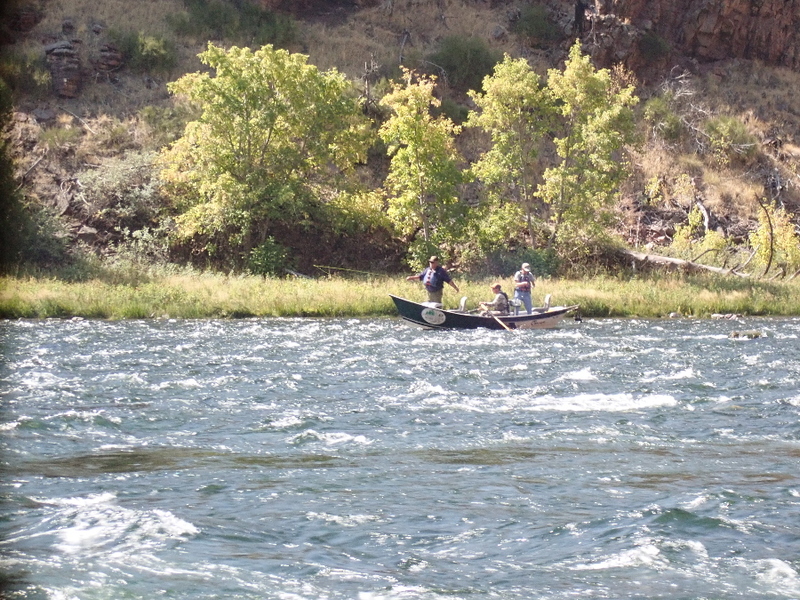 Fishermen drifting down the river. Trail damage from last years floods. 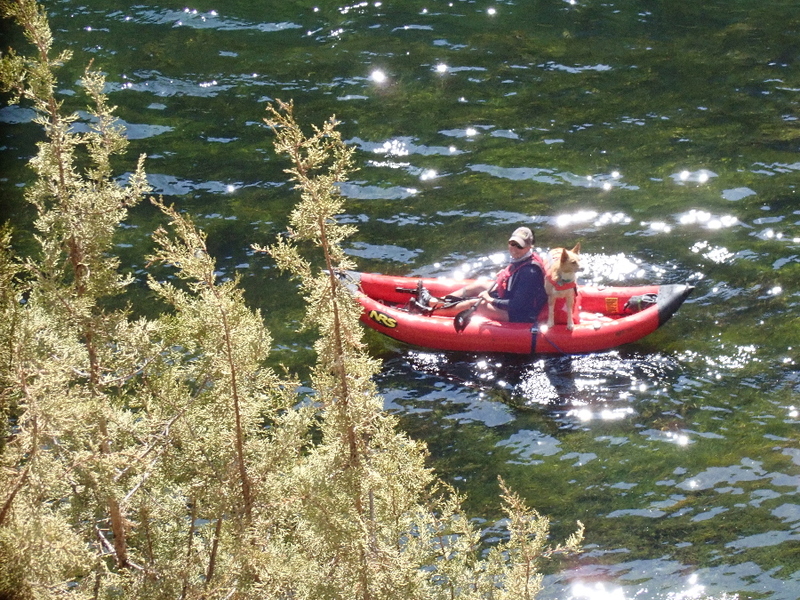 Lady and her dog enjoying the river. Our start/end point about 7 miles down from the dam. 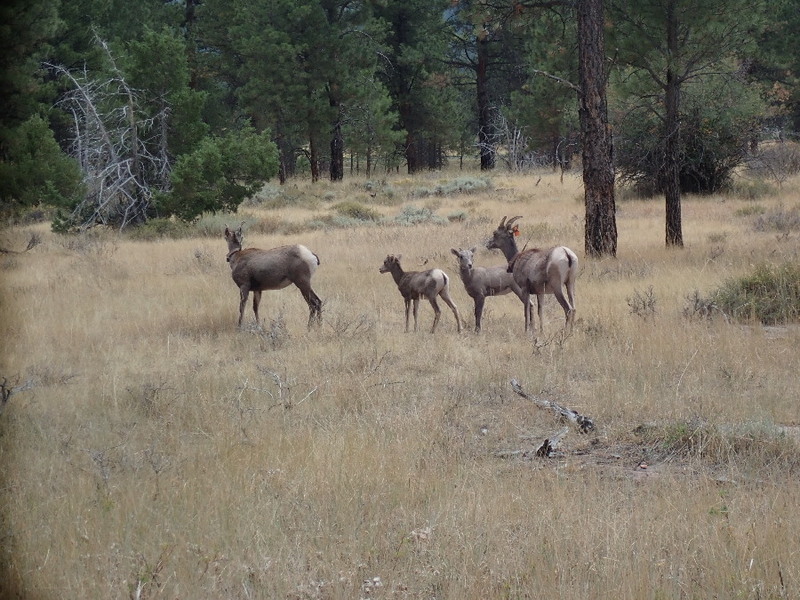 Right from the beginning when we drove into the campground we saw Big Horn sheep grazing nearby and one evening they passed real close by our site providing speculative viewing as we sipped our drinks and watched. 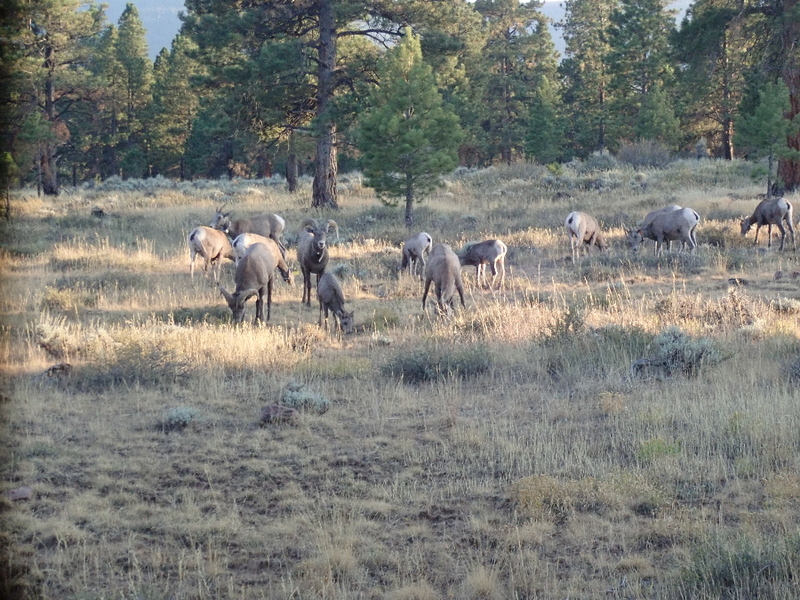 Big Horn grazing in the late afternoon o in front of our campsite. Next Next post: Dinosaurs grave.